SOUNDING MY BARBARIC GULP! : I MADE ICE CREAM! Pour the cream into a large bowl and set a mesh strainer over the top. In a separate bowl, whisk together the egg yolks. Slowly pour the warm milk into the yolks, whisking constantly, then scrape the mixture back into the saucepan. Stir the mixture constantly over medium heat with a heatproof spatula, scraping the bottom as your stir, until the mixture thickens and coats the spatula. Pour the custard through the strainer and stir into the cream. Add the vanilla ans tire until cool over an ice bath. Chill thoroughly in the refrigerator. Freeze the ice cream custard in your ice cream maker according to the manufacturer's directions. To make the sauce, mash the raspberries (let thaw a bit if using frozen) together with the sugar and vodka until they're juicy but with nice-sized chunks of fruit. Chill until ready to use. Lebovitz's original recipe calls for layering the finished ice cream with the raspberry sauce in a container to make a swirled ice cream. You could, of course, substitute any berries in the sauce. If you have the kind of ice cream maker that uses a frozen container (like the Cuisinart 1-1/2-Quart Automatic Ice Cream Maker ) it is imperative that the container is completely frozen (at least 24 hours in the freezer) and that it remains upright while freezing. You want the liquid inside the bowl's walls, the stuff that freezes the ice cream, to be evenly distributed. 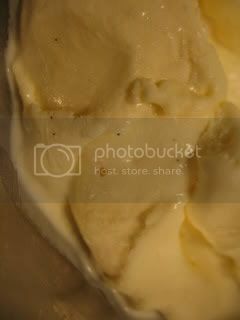 You should also make sure your custard is cold before churning it in the ice cream maker. If it's too warm, it won't freeze and thicken properly. I used pear-flavored vodka in the raspberry sauce, though you couldn't really taste the booze. 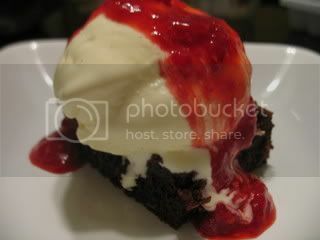 This ice cream and sauce was particularly tasty over warm, freshly-baked, gooey, dark chocolate brownies. Me? First to post on this gorgeous delicious looking post? I am honored! They look divine! Can't wait to see your tarts!